The days are definitely getting cooler, the John Lewis advert is on telly, and the phones are ringing off the hook here at Office Christmas. Aside from crawling under our duvets and hibernating until Easter, there’s no way to deny it; Christmas is here. 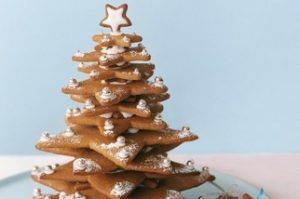 We’ve put together a few Christmas bake ideas to help you get your office into the festive spirit. 1. Turn on radio and switch to any station shamelessly playing Christmas music. 2. Take a large glass. 1. Preheat the oven to 220°c/ Gas Mark 7/ 200°c Fan. 2. Place the puff pastry onto a lightly floured surface and roll out a little. Slice the pastry lengthways so that you have two long strips. 3. Remove the sausage meat from their skins and add to a bowl. Mix in the cranberries, orange zest and sage leaves until well combined. 4. Halve the sausage mixture and form into a long sausage shape on one half of the pastry. Brush egg on one side of the pastry and fold over the mixture, ensuring that it overlaps the other side. Repeat with the other strip of pastry. 5. 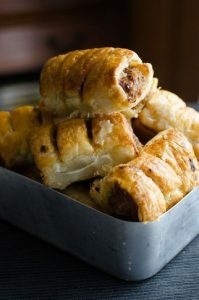 Cut each long roll into 6 different pieces and gently pinch the edges to avoid any sausage over-hang. Move to a tray covered with a non-stick baking sheet. Brush with beaten egg and bake for 20 minutes or until golden brown. 6. Remove from the oven and allow to cool before moving to a tin. 7. Take to work and share with only the Merriest of Meat-eaters. 1. Sift plain flour into a large mixing bowl. Add diced butter and rub together. 2. Add caster sugar and salt and mix until well combined. Form a ball, turn out and knead briefly. 3. Preheat the oven to 200°c/ Gas Mark 6/ 180°c Fan. 4. 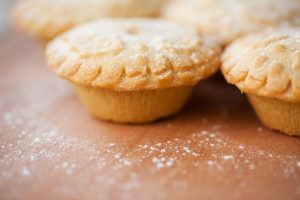 Line a tin with walnut-sized balls of pastry and push down gently to make a pie shape, leaving some aside for the lids. Spoon mincemeat into each of the pies. 5. Take slightly larger balls of the pastry and flatten the lids. Gently seal the pies. Brush the tops with beaten egg. 6. Bake for 20 minutes or until golden brown. Remove from the oven and leave to cool in the tin for 5 minutes. Transfer to a wire rack. When cooled put in a tin and dust with icing sugar. 7. Take to work and make someone’s day. 1. Preheat the oven to 180°c/ Gas Mark 4/ 160°c Fan. 2. Sift the flour, bicarbonate of soda, baking powder, spices and a pinch of salt into a bowl and put aside. 3. Beat the butter and brown sugar together until light and fluffy. Add the honey and whole egg. Gently beat in the dry ingredients until the mixture comes together. Divide in half, wrap separately in cling film and refrigerate for at least 30 minutes. 5. Place the stars of the same size on a baking sheet lined tray, around 3cm apart. Larger stars need to be baked for around 8-10 minutes, smaller stars for less; perfect stars should be deep golden in colour. 6. While your gingerbread is cooling, make the icing by adding the icing sugar bit by bit to the egg white until combined. 7. Stack the largest stars at offset angles, placing 2-3 4.5cm stars in between. Glue each layer with icing. Continue stacking in decreasing size until all 7.5cm stars are used. Finish with on 4.5cm star flat and a second one upright. 8. Decorate the points of your gingerbread tree with the rest of the icing and edible silver balls. Leave to set for around an hour and dust with icing sugar. 9. Take to the office, place on the side, admire for around 5 minutes and devour.